One of our favorite things about living in London is it’s accessibility to the rest of Europe. We can hop on a plane or train and be in another country in such a short amount of time. There are plenty of travel deal websites, offering great prices on weekend holiday’s. Now that we’re feeling more settled, we felt like it was time for a new adventure! Off to Brussels we went! Dan was able to take a 1/2 day on Friday, and we took a mid-afternoon flight to Belgium. Crazy that it’s just a 45 minute flight! 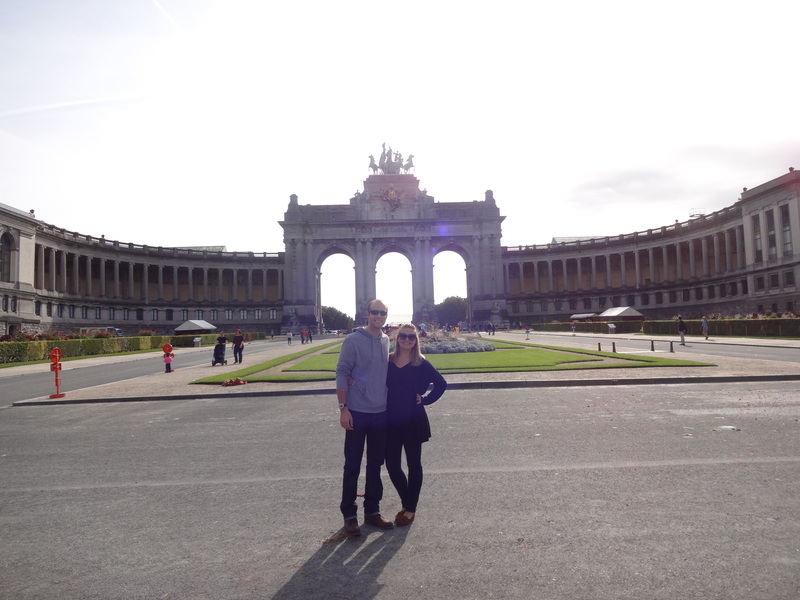 Dan and I didn’t have any expectations for the city, but were pleasantly happy with what it had to offer. We were able to visit some of the historical sites via an open bus tour. There were some really beautiful cathedrals and monuments. The city centre is known as the Grand Square which was bustling with street performers, food trucks, artists and anything else you could possibly think of. There were 2 weddings going on too! The Atomium is a very unique “building” – it’s deemed the image of Brussels. It’s definitely a cool site – just not quite worth walking up to the top. It was supposed to be a museum – but it was kinda lame 🙂 But seeing the structure was definitely worth it. Our favorite part of the trip was the FOOD! We totally over indulged in all that Brussels had to offer! We enjoyed the waffles, frites, mussels, beer and the CHOCOLATE! I think I’m still having chocolate withdrawals with how much chocolate we consumed :)! We were advised that all chocoholic’s should check out Place du Grand Sablon-Grote Zavel Plein, where there are 3 shops that sell some of best chocolate in the world: Neuhaus, Pierre Marcolini and Wittamer. We checked all three of them off our list – with Neuhaus being our favorite!!! Another big part of our trip was the beer. Belgium is home to some of the best breweries in the world. They are known for their gueuze, kreik, sour and monk beers (along with many others). Gueuze and sour beers are my absolute favorite, and Dan loves a good trappist beer (meaning that it is brewed by Monks!). We checked out some great pubs and searched for some hard to find beers. We were able to do a tour of Cantillon brewery. The last traditional gueuze/lambic brewery in Brussels, Cantillon still uses natural yeast fermentation and are made in original style with no sweeteners or syrups added. I was in heaven – their beers were some of the best beer’s I’ve ever tasted! It was also fun to sit with another 2 American couples and hear about their travels across Europe. Overall, it was a great weekend getaway! We’re so excited for all that Europe has to offer! I think our next getaway will be for Dan’s birthday!! !